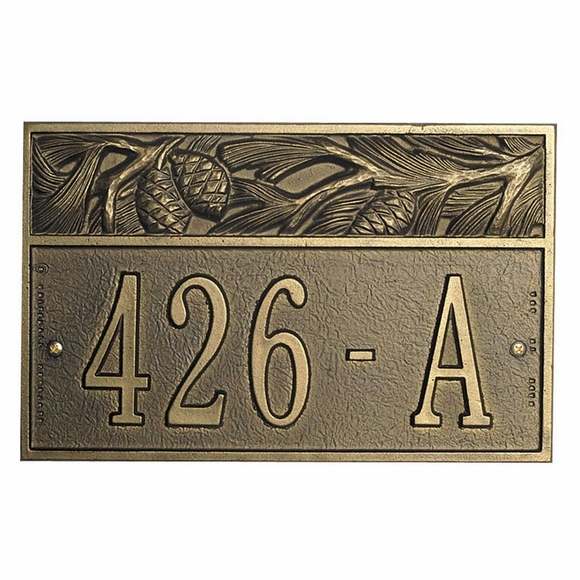 Custom House Number Sign - - the Pine Cone Address Plaque with up to five large numbers. Wall mount. Made in USA. The decorative upper panel contains a design of interwoven pine cones, pine needles, and evergreen branches. Personalized with your choice of 16 color combinations and house number you provide. Shown above in antique brass. This Pine Cone Address Sign features a woodland theme panel across the top.